Cassidy's Cause is a 501(c)(3) nonprofit organization whose mission is to help individuals grow and develop through recreational activities with horses. Founded in 2013 by Mike Falconite, Angie Jackson, and Dara Triplett in honor of Cassidy Triplett whose love for horses continues to inspire others. Cassidy's Cause exists primarily on charitable contributions and fundraisers. Our mission is to provide individuals with disabilities the opportunity to grow and develop through therapeutic, educational and recreational activities, while on a horse. 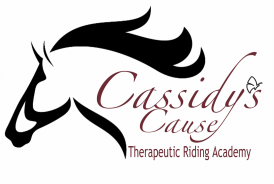 Cassidy’s Cause Therapeutic Riding Academy helps individuals move beyond the confines of their bodies and disabilities into new, unexplored worlds. Watching individuals interact with horses and gain confidence and self- esteem is truly an unforgettable experience. Proud parents observe their children sitting tall in the saddle, smiling brightly and laughing uncontrollably while riding horses. For individuals with impaired mobility, horse- back riding gently and rhythmically moves their bodies in three planes: forward & backward, side to side and up & down. Riders experience increased balance, muscle control and strength. Horseback riding helps individuals with learning or cognitive disabilities improve their concentration, recognition, vocabulary and task completion. The unique bond formed with the horse can help improve personal relationships, patience and behavior among individuals with psychological or emotional disabilities. Cassidy’s Cause Therapeutic Riding Academy’s state of the art facility sits on 22 acres of beautifully groomed pastures. The rolling country side provides a relaxing environment that some might consider therapy in itself. CCTRA has become a home away from home for students, parents, volunteers and all who visit.